We all like to have lovely landscapes and houseplants, but, if we have pets, there are some plants that can be toxic to them if eaten. There are some plants that can be deadly if consumed by pets; azaleas, cycads or sago palms, and oleanders. Others can make animals sick. We are usually familiar with the Dieffenbachia or dumb cane dangers since they affect humans too. Chewing on this plant can lead to suffocation because the Calcium Oxalate crystals in the plant tissues cause the throat to swell. But, there are many more common plants that are used in the landscape and as house plants that can cause distress for our pets. Some of the common house plants are aloe, amaryllis, caladium, peace lily, calla lily, elephant ears, philodendron, antherium, and pothos. Cats are particularly sensitive to lilies like daylilies and crinum lilies. Other plants that we use in our landscapes that can be toxic include; dracaena, kalanchoe, hydrangea, lantana, yucca and iris. Even tomato plants are toxic. The Veterinary Pet Insurance Company released a top 10 list of plant poisoning claims. While raisins and grapes caused the most problems along with some other edibles, many of our familiar plants are on the list. Number 4 is Lily - the poisonous component for cats has apparently not been identified. Even ingestion of very small amounts of a lily plant could result in severe kidney damage. 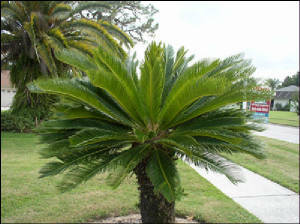 Number 7 is Sago Palm - All parts are poisonous, but the seeds contain the largest danger. The ingestion of just one or two seeds can result in vomiting, diarrhea, depression, seizures and liver failure. 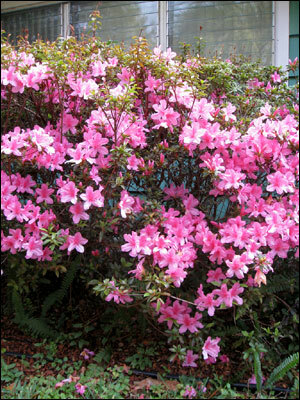 Number 9 is Azalea - ingestion of a few leaves can result in serious effects that typically occur within a few hours after ingestion and can include acute digestive upset, excessive drooling, loss of appetite, diarrhea, depression and weakness. Number 10 is Hydrangea – ingesting parts of this plant can result in a gastrointestinal disturbance with vomiting, depression, and diarrhea. If you have pets and also have any of these problem plants, use common sense. If your pet does not usually choose to chew on plants, then it shouldn’t be a problem. If you have a dog or cat that likes to dig, then Amaryllis, caladiums, and other bulbs may not be appropriate for your landscape since they might dig them up and decide to chew on them. You could consider removing the toxic plants or fencing the area off to the pet. Several of the plants I listed are also used as house plants and that could create a problem. Sometimes animals, especially dogs, which are bored, will chew just for the fun of it. If you choose to keep the plants, familiarize yourself with the symptoms that a pet may show if they ingest one of these plants and seek help immediately if your pet shows any of these symptoms. This list is not complete. If you are concerned about any plants, do some research at the library or on the Internet. If you still have questions consult with your veterinarian. The ASPCA web site has comprehensive searchable information about plants that are toxic or non-toxic to pets: http://www.aspca.org/pet-care/poison-control/plants/. I have gotten many questions about Chinch Bug control lately and the University of Florida/IFAS Extension publication below outlines the latest research information about controlling these pests in your St. Augustine grass. What are chinch bugs and why are they killing my St. Augustinegrass lawn? Chinch bugs are small insects (1/8th inch long) with straw-like mouthparts that feed on the fluids in grass plants. Immatures (nymphs) and adults feed in groups while hidden at the base of the grass. Infested turf eventually grows slower, yellows, then dies in small patches. The speed of turf death probably depends on chinch bug density and the turf’s overall health (stressed grass will likely die faster). Why are chinch bugs hard to control? · The insects and/or their damage could be easily misdiagnosed. Scalping, animal urine, diseases, drought and other things can cause dead spots in St. Augustinegrass. Make sure the insects are present in the thatch. · Each year, chinch bugs have 3-10 generations (active from April to October in northern Florida, nearly year-round in southern Florida). All life stages (eggs, nymphs, adults) are present at the same time. Current insecticides only kill nymphs and adults, so eggs can still hatch and produce another generation. Chinch bugs usually complete their development from egg to adult in 5-6 weeks. One adult female can live 1-2 months and lay up to 300 eggs. · Natural enemies (e.g., big-eyed bugs, spiders, a parasitic wasp, and others) are not abundant and efficient enough to keep chinch bug populations under complete control, all the time. However, insecticides can kill them. · Some insecticides bind tightly to organic matter (e.g., leaf blades, thatch) if they are not applied with enough water volume or are not irrigated soon after an application. The insecticides must get to where the insects are living and feeding to be effective (not stay on the grass blades or go down to the soil, if the plant crown is the target area). · Most insecticides used against chinch bugs break down within 2 months or less, and might need to be reapplied. Some factors that affect the length of insecticide residual include pH, soil type, and amount of thatch. · The insecticide dose may not be correct. Be sure to follow label instructions to apply the right amount of product. · Some chinch bug populations have been repeatedly treated with similar insecticides for years. A few chinch bugs may survive each treatment, lay eggs, and pass on their ability to tolerate the insecticides. Since chinch bugs don’t move far, insecticide tolerance/resistance may be localized to areas that have been under long-term, intensive lawn care. · Heavy fertilization may lead to excessive thatch build-up and provide chinch bugs with better quality food, so they may develop faster, more of them may survive, and females will lay more eggs. Should I work with a professional lawn service or manage the lawn myself? · Commercial applicators are trained to correctly identify pests, and can better manage pests with properly timed applications of products known to be effective. · Some new insecticides and certain formulations of older ones are not available to homeowners, so only professional applicators can buy them. · If a lawn has a history of infestation, consider doing one spring and maybe a late summer application to keep pest numbers low. Fewer applications mean that natural enemies can live to help suppress pests. · Lawns treated with insecticide <3 times each year are less likely to have pesticide-resistant chinch bugs. What can I, the consumer, do to help? · Notify your lawn service before chinch bugs are abundant and turf damage becomes severe. · Turn on the irrigation after an application has been done, if directed to do so. · Make sure your irrigation system is functioning properly. Chinch bug damage resembles drought stress. · Please understand that lawn care is a service industry, and they are doing their best to ensure that you have a lawn that you can safely enjoy. Switching companies in the middle of a resistance problem helps to perpetuate the issue. What is the industry doing about insecticide-resistant chinch bugs? · Where resistance is suspected, insecticides with different modes of action should be rotated. Based on UF testing, consistently effective treatments have at least 1 of these ingredients: bifenthrin, carbaryl, clothianidin, or trichlorfon. · High label rates of these insecticides might be used to ensure that most of the “resistant” chinch bugs are killed. This may, however, increase the cost of chinch bug control. · UF researchers are studying how cultural and biological controls affect chinch bug populations.